It gives me an immense sense of honour and togetherness to address you all on the occasion of International Womens Day on 8th March 2016.
International Women’s Day is a global day for celebrating the social, economic, cultural and political achievements of women. From time immemorial, women are the driving force that propel the wheels of families, communities, societies and the nation. Tirelessly. A woman is always an eco-system, balancing multiple roles, multiple commitments, at multiple places of work – both in office and also at home. Good health or bad health, the tasks of bringing up children, and other home-making works don’t give any break. In addition to these, many of us are engaged in other interests like music, painting, culture, sports etc., and it is really a miracle that women manage to do so many things, and still appear cheerful and charming. The word multi-tasking doesn’t find more resonance anywhere. In spite of the effervescent and vibrant roles that women play as mothers, sisters, daughters, friends, soul-mates, co-workers and in social service, women are often trampled upon in world societies. In place of due recognition for their stellar roles, women are subject to gender discrimination and bias, and even gender violence. We hear gruesome incidents of women and girls being abducted and abused, the world over. In war torn Nigeria and Iraq, women are soft targets and abducted for slavery. In feudal societies at home and abroad, women are killed for honour. And girls are not allowed to even attend school, in many parts of the world. This discrimination is rampant not only in places that are known for medieval mindset, but even in most modern office spaces. Organisations discriminate women in matters of pay and respect. The marketplace treats women as commodities. Yet women and girls have shown resilience, even in the face of life threatening adversities. From the stellar example of Malala Yousufzai to the unsung stories of many, girl children have fought back the world over, to claim their right to education. Beno Zephine from Tamilnadu fought to overcome her handicap and became the first 100 % visually impaired person to become IFS officer. From Indra Nooyi (Chairperson – Pepsico) to Padmalatha Warrior (CTO for Cisco, Motorola), to Kiran Mazumdar Shah (CEO – Biocon), women have made their stellar mark in office and workspace. Sania Mirza and Saina Nehwal make World no. 1 and no. 2 look simple. These success stories throw up three ingredients of women’s success. The three E’s. Education, enabling and empowerment. Its women’s right to receive equal education, in villages, towns and cities. Education creates the platform for women to unshackle the gender bias, discrimination and fosters confidence and self reliance. Give women the right education and training, safety in work-place and transit, freedom from violence and discrimination, respect as an equal gender, belief in their capabilities – the society will transform into a much better place. Societies should engage in providing enabling conditions for women to flourish, and achieve success in their various roles at home and workspace. Conditions for professional growth, identity, recognition, keeping in the mind the special needs of child rearing and health. But enabling cannot happen without empowerment. In Beijing Declaration of Womens Rights 2015, UNO declared the campaign slogan as “Empowering Women, Empowering Humanity”. 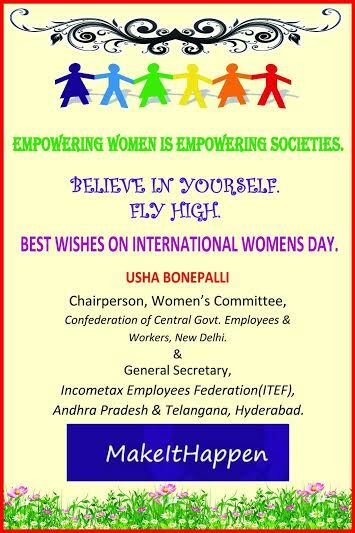 Recognition is dawning that empowering women empowers humanity. But no one gives empowerment to women on a platter. Its our challenge to claim and fight for it. There is no easy path to achieve this, and I call upon all women comrades, to struggle for equitable rights, with passion, determination and hunger for success, with belief in yourself. Women should claim their share of empowerment, with all confidence and might, for women are second to none. Yes, we can do it. We can make it happen. With confidence in our abilities, and belief in ourselves. Lets join hands today and take a pledge. We will make it happen. Believe in yourself.